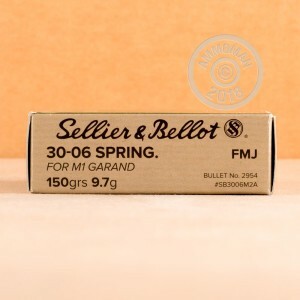 This 30-06 Springfield ammunition by Sellier & Bellot is an affordable range ammunition perfect for the M1 Gerand. Each cartridge has a 150 grain M2 Ball full metal jacket (FMJ) bullet that combines speed and accuracy to give you impressive results on the range. Each projectile leaves the muzzle at about 2887 fps, and achieves 2777 ft/lbs of energy transfer simultaneously. Sellier & Bellot assembles this 30-06 Sprg ammo with new production brass casings and non-corrosive Boxer primers. 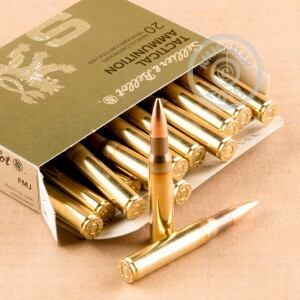 These casings are of the finest quality and reloadable. If you are weary about the quality of ammunition you load into your cherished M1 Gerand, these cartridges are backed by 190 years of manufacturing experience. One of the oldest ammunition manufacturers in the world, Sellier & Bellot established themselves in 1825 and are currently located in the Czech Republic. Your M1 Gerand isn't getting any younger, so do not wait; order a few 20-round boxes of this 30-06 ammo and hit the range today!